Happy Bakrid to all !! How are your preparations for Bakrid going on?? Hope all my muslim friends are busy celebrating Bakrid with your loved ones. Today's post is a simple yet yummy snack prepared with eggs that you can add for this festive season. Eggs are an excellent source of calcium, high quality protein, fats and essential vitamins. When we talk about quail eggs, the nutrition is much higher than chicken eggs. If you are using chicken eggs, then make it half or quarter and cover it up with chammanthi /chutney and then proceed the same way as mentioned below. However, I felt that quail eggs were perfect for making this snack. The chutney adds a unique flavor of spice,sour and salt and finally coating with bread crumbs. 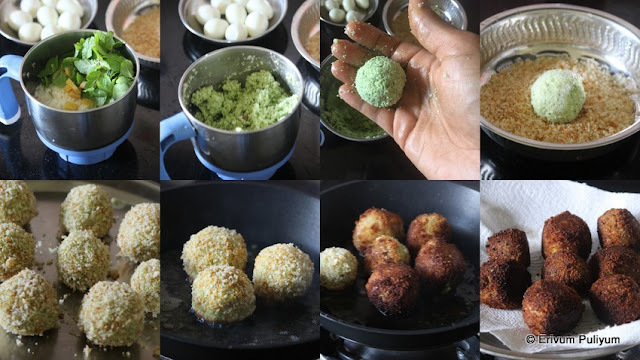 Do give these balls a try as a pleasant surprise (inside) for kids and enjoy !! Hard boil the eggs in enough water with salt for 10-12 mins. Transfer to a ice cold water bowl and remove the shells after 7-8 mins. Keep aside. In a blender/ mixer jar, add the grated coconut,coriander leaves, pudina, green chillies, ginger and salt. Squeeze the lemon and blend coarsely. Don't add any water to grind,it comes out perfectly. Transfer to a bowl and in your palm place a table spoon or slightly lesser amount of chutney,spread it and place an egg in it.Cover the egg completely with the chutney as shown in pic. In another bowl,beat an egg lightly. Keep aside. Also keep the bread crumbs ready in a plate. Dip the chutney covered egg in beaten egg and coat with bread crumbs like we do for cutlets. Keep aside and repeat the same for all the other balls. Heat oil in a wok if deep frying or a non stick pan if shallow frying. Slide the balls once the oil is hot, and if you are shallow frying like I did then, keep rotating the balls at low flame so that its evenly browned on all sides( takes 2-3 mins for each ball). If you are shallow frying, don't add more than 3 balls at a time as it takes time to rotate each ball and if you add more than that you may end up with burnt balls. Serve hot with ketchup !! * I have taken 3/4 coconut grated which was just correct to cover the quail eggs. But if you are taking regular eggs then you may have to increase the amount of grated coconut. * Alter green chillies as per tolerance. I added two chillies and it was mild spiced.